Kingswood Oxford hosted another successful Girls and Women in Sports Day On Saturday. The free event was for girls from ages 8-14 and was held from 9:00 am to 1:00 pm in the state-of-the-art Hoffman Field House. 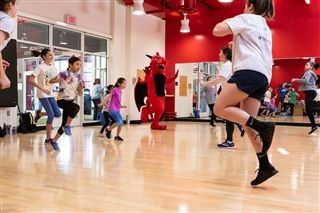 The event drew 120 participants who chose from three activities that ran for 40 minutes each including volleyball, basketball, field hockey, track, strength and conditioning, yoga, lacrosse, tennis, and soccer. All skill levels, including those who had never tried a particular sport before, were encouraged to participate. The day also included a team building challenge, a lunch break, and snacks. Girls were joined by Kingswood coaches, staff, and student-athletes, who ran small games to help teach and practice skills.